When Baghdad was the Centre of the Scientific World! In 2011, I published my book ‘Once Upon a Time in Baghdad’ a creative non fiction book about my two decades life in Baghdad, where I was born. What prompted me to write my book at the time, were the many questions from my European and American friends. Was I a Moslem, did we also walk around covered from head to foot, were we also poor, and more such ignorant questions. Many were surprised to hear that Baghdad during the time I grew up there, was a cosmopolitan multi cultural buzzing town, that Christians Moslems and Jews and others lived and worked side by side, that I drove a car at the age of 16, that I attended a French Convent and learned 3 languages, that we watched the latest Hollywood movies, with Arabic subtitles, bought Vogue magazines for our fashion, etc. I decided to put down on paper what life was like in those years, known as the golden decades of Baghdad, seen and experienced from a young Christian woman’s viewpoint. There were no chadors, hijab, niqab or burka, and only the illiterates and the farmer women walked around covered in a black abaya, their faces uncovered except for the very few, the very Moslem orthodox. The women were never dressed so drab and colourless in sad dark colours as they dress today and their hair was never covered. In fact, I was never even aware of these modes of Moslem dress until the past few decades when suddenly they appeared out of nowhere. They might have existed in Saudi Arabia or Yemen perhaps but these were considered backward countries. During the Moslem Feast days especially, the Moslem families, women and children, came out dressed in their most loud shiny colourful dresses of taffetas and silks, singing and dancing happily. We all lived respecting one another without imposing our cultures on one another. We, the non-Moslems, were all very aware that we lived in a Moslem country, but we were free to live according to our religious beliefs without fear. The local schools and businesses for example, had Fridays off, the Moslem day of rest, while the Christian community had Saturdays and Sundays off and of course the Jews their holy Sabbath. Everyone practiced their faith without any threats from anyone. In my book, I take the reader on a journey through life in the city of Baghdad as I relate our family life. No one interested in history and who wants to know Baghdad as it was 50 years ago, should miss this. All young Arab men and women should read this to be aware that the Islam they know today was not always as they know it, namely, violent, artificial, limiting and debilitating, imposed on them by some religious fanatic leaders taking them backwards in time to ignorance and darkness rather than forward evolving to a bright future for the Arab world in this 21st century. When I was writing my book I did a lot of research through libraries, also on the web. To my dismay only a couple of years after that, I discovered that much of the information that I had found at the time had disappeared, information changed, websites disappearing. By whom or why or to what purpose? Who knows! Anyway I found this information today that I thought I’d like to share about the ancient history of Baghdad, the city of the One Thousand and One Nights. If you are remotely interested in history you should read this article that appeared in 2010 in the Guardian. Read it before it disappears too by some crazies who want to change history! And perhaps you’d like to read my book ‘Once Upon a Time in Baghdad’ so that you have an idea of what life was really like for normal families in a famous Arab City before the Islamic movement. The invasion of Baghdad by the US removing Saddam Hussein changed it forever to it worst ever for the Iraqi people. According to them they removed a monster, but what they created is far worse for the country, they created monsters who are threatening the whole civilised world. Perhaps this was the plan all along, again who knows! 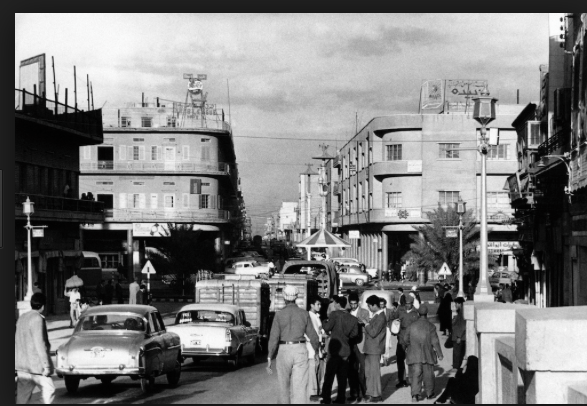 Here’s an image of a street in Baghdad from the 1950s. Here’s another image of my parents walking down al Rashid Street in the 1940s! It literally breaks my heart to see what Baghdad and the Iraqis are going through today. Every one who I have ever known has left the country! But I have friends who have relatives who still live there and we get the real news of what goes on there and not that of the general media. It’s ironic that the people are far worse off today than they ever were before the US, driven by greed for oil and power, invaded, killing thousands and looting the country. Of course you do not hear that from the regular media but any Iraqi living there today will tell you that. You can actually also find videos by guilt ridden US soldiers who tell the same story. This entry was posted in activists, consciousness, conspiracy theories, Education, empowerment, energy, enlightenment, history, human rights, intelligence, justice, mind, new world order, peace, politics, Religion, terrorism, women, Youth and tagged arab, Baghdad, fanatism, illiterate, invasion, islam, justicce, oil, power, Religion, u.s., War, women on 18/10/2015 by mkirtikarphd.